The Process is near completion. Last year, the Philadelphia 76ers posted their first winning record since the 2004-05 season. They made the playoffs for the first time since the 2011-12 season. With the Eastern Conference wide open, now is their chance to compete for an Eastern Conference title. Trust the process. Those three words have been a symbol of Philadelphia basketball since 2014. After drafting Joel Embiid and Ben Simmons, the process hit a little speed bump, but the wait was well worth it. Combine them with the veterans that the 76ers have on the team and you have the makings of a potential playoff team. 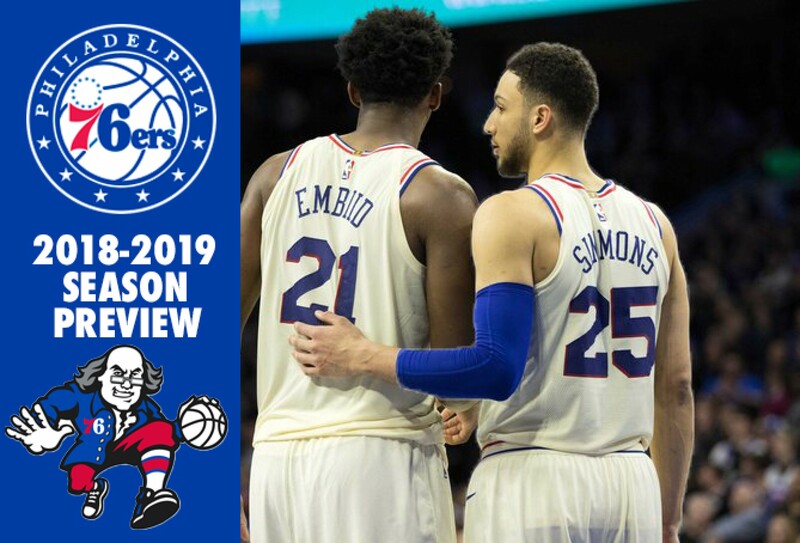 With Brett Brown as the head coach for the last five seasons, he has earned the trust of the organization as well as the community after transiting the 6ers from the loveable losers to a playoff contender. Their 2017-2018 season ended with a loss to the Boston Celtics in a five game in a Eastern Conference Semifinals appearance. They will look to avenge that loss. With the Eastern Conference open for the first time in a decade, now is the time to strike. Here is a preview of the 2018-2019 Philadelphia 76ers. Philadelphia came into draft night with six picks in total (two first-round picks and four second-round picks). With the 10th pick, Philadelphia selected local small forward Mikal Bridges from Villanova University. However, the 76ers would trade Bridged to the Phoenix Suns for the 16th pick that became Texas Tech University guard Zhaire Smith and the Miami Heat's unprotected 2021 first round pick. Smith averaged 11.3 points, 5 rebounds, 1.8 assists and 1.1 steals in 28.4 minutes per game his lone season at Texas Tech. With the 26th pick in the draft, Philadelphia selected Wichita State guard Landry Shamet. During his junior season, Shamet averaged 14.9 points (on .489 shooting percentages with a very good .442 three-point percentage), 5.2 assists, 3.2 rebounds, and 0.7 steals in 31.7 minutes per game throughout 32 games played and stated. Philadelphia would then trade three of their second-round picks, selecting Southern Methodist point guard Shake Milton with the 54th pick. The Philadelphia 76ers went one week into free agency and then lost general manager Bryan Colangelo. Colangelo resigned on June 7 after his wife confessed to running Twitter accounts that criticized team members and propped up Colangelo. Brett Brown has taken control of basketball operations in an interim basis since. They lost veterans Ersan İlyasova to the Milwaukee Bucks and Marco Belinelli to the San Antonio Spurs. James Michael McAdoo will play overseas after signing with Auxilium Torino. J.J. Redick resigned with the 76ers on a one-year, $12.2 million deal on July 6. Amir Johnson also signed a one-year deal worth 2.39 million. On July 3, the 76ers sent minimal cash considerations to the Denver Nuggets in exchange for Wilson Chandler a 2021 second round pick and the rights to swap 2022 second round picks. Demetrius Jackson, Shake Milton, Norvel Pelle and Anthony Brown signed two-way contracts. The Philadelphia 76ers have the tools to run the table and make a run at a NBA Finals appearance. They have the reigning Rookie of the Year in Ben Simmons and defensive player of the year in Joel Embiid to go along with potential Coach of the Year candidate Brett Brown. The top-five in the league are going to be tough. Rival Boston Celtics are one of the deepest teams in the Eastern Conference, the Toronto Raptors made adjustments with the Indiana Pacers, Milwaukee Bucks and Washington Wizards also in the mix. As a team with not many weaknesses, they could be on a crash course with the Boston Celtics once again in the Conference Semi-Finals or Eastern Conference Finals. Of course, guys like Ben Simmons, Markelle Fultz and J.J. Reduce will have to improve their shooting if they hope to get past the Celtics. With Philly already being one of the younger teams in the NBA, the 6ers hope is that Fultz, Zhaire Smith and Landry Shamet will produce in the opportunities they are given. If the young Philly players are able to do that, they could be competing for a No. 1 seed. With the the start of training camp looming, will the 76ers bring in another experienced veteran like Jamal Crawford or Nick Young enter the fold? Simmons has been vocal that he would like a Jamal Crawford on his team. With no general manager in place, that could be prove to be difficult to Philadelphia to do. As for individual awards go, Ben Simmons could be a dark horse for MVP and a All-Star appearance. Embiid and Covington could also be considered for All-Star nods. Embiid and Simmons could earn their way to a NBA All-Team appearances as well. Depending how Smith performs this season, he could be featured on the 2018-19 All-NBA Rookie Team. The Westgate Las Vegas SuperBook has Philadelphia's over-and-under of wins at 54.5 wins.